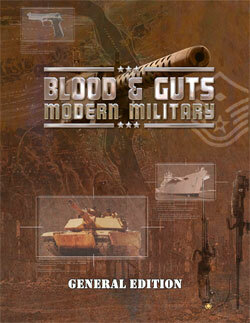 The premier modern military sourcebook for the d20 system is reborn with Blood and Guts 2: General Edition. The General Edition collects the core books in the Blood and Guts 2 series into one volume. Military Training Manual includes new advanced classes that allow a wide variety of military characters to be built using a new system of advanced training talents and bonus feats. Variant combat rules allowing the game master to dial in the level of realism he wants in his modern combats, whether those combats take place in a war zone or in the streets of Hong Kong. Statistics for popular land, air, and sea military vehicles. War on Terror is a campaign model that serves as a foe manual for the Blood and Guts line.